A splendid monsoon destination called "Dudhsagar Falls"
“Dudhsagar” literally meaning sea of milk, is one of tallest waterfall in India. At a height of 1017 ft, gushing white stream of water gives an illusion of flowing water in Dudhsagar waterfalls.Mandovi river, which is the main river of Goa, forms this waterfall. The river originates in Karnataka, flows its ways through western ghats and falls into deep green pools at the base of this waterfall. Dudhsagar Falls are divided into four-tiers of Mandovi river. It further flows to Arabian Sea. Although, Goa well known for numerous beaches, these falls held a special place among tourist spots. 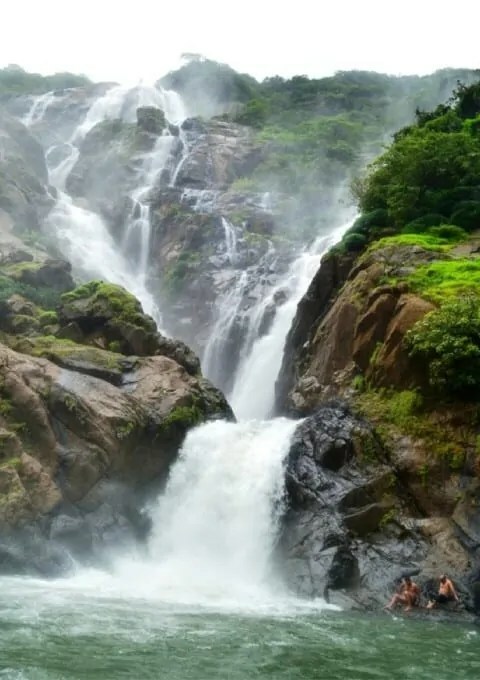 Dudhsagar waterfalls are one among the top five highest waterfalls in India and top 100 waterfalls in the world.The area around the waterfalls is forested and come under Bhagwan Mahavir Wildlife sanctuary. Best time to visit the falls are in Monsoon. During the season, majesty of the waterfall is at its peak. Only way to reach Dudhsagar is by foot or by train. Preferred way is to travel by train, although there is no designated station specific for the falls. During monsoon season, trekking is bit difficult due to slippery and rough terrain throughout but is equally adventurous. Any shop for eating and drinking is not available throughout the trek, so it’s better to come prepared if opting for trek. Ideal time required for the visit is one day. In one day, you may also visit Devil’s canyon, Tambdi Surla Temple and Bondla wildlife sanctuary apart from falls. Kumbhalgarh Fort: The second longest wall in world after “Wall of China”.